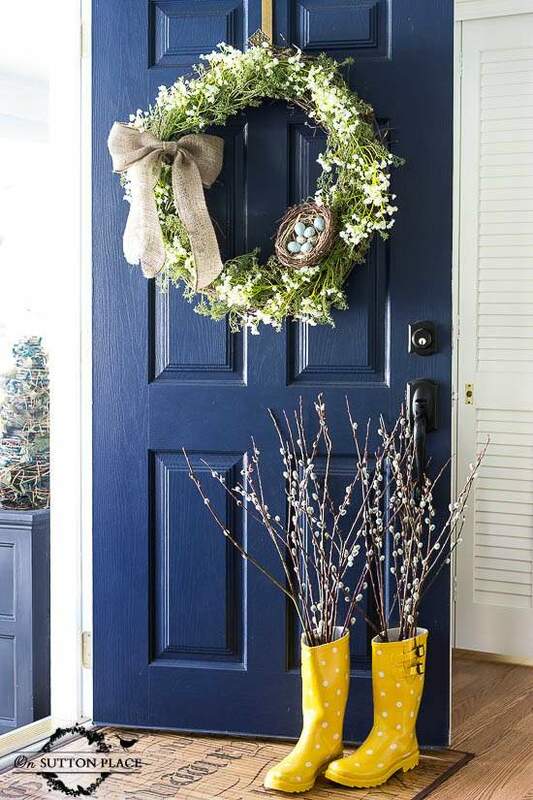 Naval by Sherwin Williams is the perfect navy blue paint color for any room in your home, the exterior of your house or even your kitchen cabinets. If you’ve been following this blog for any length of time, you’ll already know that my favorite color is blue. And when it comes to blue colors, I think a good navy blue is pretty darn perfect in my book. My all-time favorite navy paint is Naval by Sherwin Williams. I’ve used it several times now and it never fails to disappoint. I’ve rounded up several beautiful spaces that use this stunning navy paint so if you’re inclined to go to the dark side, hopefully these will persuade you! This living room uses Naval on the top portion of the walls paired with crisp white board and batten. Other navy elements are pulled in through the rug and throw pillows to create a beautiful nautical look. So pretty! Looking For More Interior Paint Colors? My eldest son’s room has a Naval accent wall because it was the only place in our house that my husband would agree to navy. I originally wanted to paint our dining room navy but it was nixed. But hey, we got a pretty fun accent wall here instead! I think with the gray paint (Stonington Gray by BM) and the navy and white striped curtains, it looks pretty cool and masculine. My love affair with Naval first began after seeing Ann from On Sutton Place’s front door. I instantly went out and purchased a quart of paint and painted my front door too…and then all the shutters on my house. I’ve found that when used on an exterior, the paint is a bit inkier – very true to the color above. And once again, I’m considering this same color for the front door on our new house. It’s just so classy don’t you think? Naval walls with crisp white trim via Earnest Home Co.
Navy and crisp white is such a classic look. 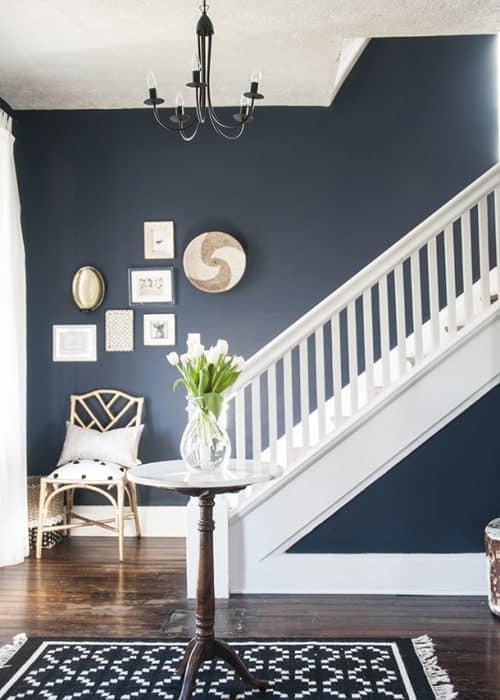 There’s something so sophisticated and elegant about the contrast between these two colors, and Earnest Home Co. has really nailed it in her foyer. Sheer navy perfection! Naval isn’t just a great paint color for walls and doors but for kitchen cabinets, too. Paired with gold hardware, it’s a navy dream! 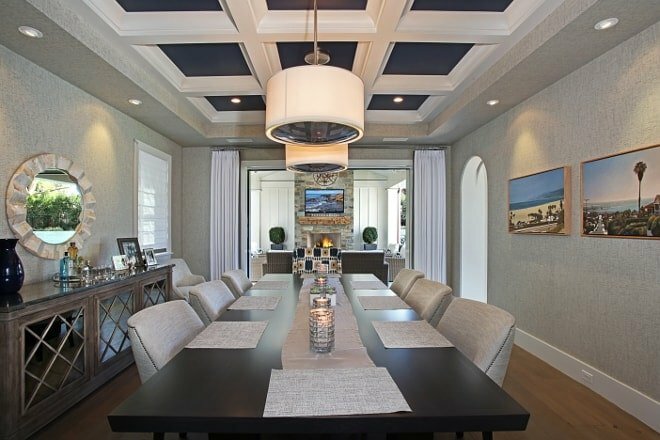 How about switching it up and painting your ceiling navy? While I don’t suggest doing this in every room of your room, it’s pretty special in a bedroom or even a bathroom. Don’t want to commit to a full ceiling of color? Partially painting the inserts on a tray ceiling brings the room to a whole new level. Last but not least, Naval is the perfect color if you’re looking to spiff up a piece of furniture, just like Jen from City Farmhouse did with this dresser. It’s the perfect way to add that navy touch to a space without having to commit to a whole wall of color! I’m off to figure out where else I can add some navy paint in my home. I’m kinda digging the idea of a navy ceiling, I just need to figure out where it would work! When painting with SW Naval for an entertainment center what finish do I need. Semi-gloss, or satin, eggshell? Hi Kathy, it depends on what finish you want! Eggshell is really only for walls so it’s up to you whether you want semi-gloss or satin. I painted my entire living room in SW’s Naval and even have navy curtains. The previous homeowners left the room flat white, and it was too “cold” to be comfy in. Now we can draw the curtains and have extra “wall” in the winter when we want to feel snug. The color makes everything on the wall pop and looks surprisingly good with our mid-century red oak floors. It seemed like a bold move to paint the whole LR his color, but navy is the color of business suits. It can be a very conservative neutral to play with. Can I put a navy couch with black twall curtains? The walls in my bedroom are SW Neutral Ground with white trim. Would Navy look good as an accent wall with Neutral Ground? Looking for a True navy for my shutter on my house. Painting the house alabaster (creamy white) and looking for a deep dark blue. Have you seen this color on shutters? Yes! We used it on the shutters of of first house, you can see it in our house tour! Thanks Jenna for your post. I am repainting a glass front bookcase and wanted to paint it navy. The top of the bookcase is unfinished with a dark wood, and one of your pics showed the wood floor, staircase, and navy walls. Perfect! My living room does not have a great deal of light, so the brighter hue of Naval will look a bit more darker, which is my preference is the room. Nearby shelving is bright white, and other walls are gray. I think it will look smashing. Thanks again! I think it will look amazing! Good luck!